Summary: The Tory obsession with reducing the deficit with a programme of accelerating austerity is causing increasing harm to the great majority of working people in the UK. By refusing to borrow to invest in infrastructure and housing they continue to demonstrate they simply don’t understand basic economics. Much of the Brexit Leave campaign blamed immigration for depressing wages and standards of living. In reality it was a deliberate strategy of a Tory government wanting to transfer wealth from the poor to those already wealthy. Increasingly people accept that immigration is critical in providing workers for so many of the jobs that just need to be done. That message must be projected to the electorate if Labour are ever to regain the support of the poor working class. It is austerity and not immigration that is at the root of our problems. The Institute for Fiscal Studies projects the number of children living in poverty will soar to around 5.2 million in the next five years because of the Tory austerity programme. All the progress made over the last 20 years in reducing childhood poverty will be reversed. The government and in particular Philip Hammond, the Chancellor of the Exchequer, continues to insist that we must balance our national income and expenditure. Only in that way, they say, can we get rid of the deficit. Sadly this seriously misunderstands economics and where money comes from. We all know that if you or I want to buy anything, from a loaf of bread to a new car, we need first to have enough money to be able to afford it. When you run out of money you can buy nothing. That’s pretty well all you need to know about home economics. You cannot print money yourself and so you have to earn it one way or another. It may be from a pension, a salary, even income from an investment but if you don’t have some income you can’t have any expenditure. When we look at the economy of a nation-state such as the UK things are very different. To understand this start with a £10 note. Signed by the Chief Cashier of the Bank of England it says “I promise to pay the bearer on demand the sum of £10”. If you go to the Bank of England and ask for your £10 you will simply be given a replacement £10 note. There’s nothing else. Many years ago there was a lot of gold in the basement of the Bank of England but that has long since gone. So where did this £10 note come from? Well basically it was printed by the Bank of England. And who said they could do that? They simply decided themselves that that was a good thing to do. In this way the amount of money in circulation in the UK has increased over the years, currently over £43 billion and rising. The Bank of England can print pretty well what it thinks fit. After the financial crash in 2008 they started printing money on a very large scale. Over the last 10 years the total is in the region of £500 billion. Virtually all that money effectively went to banks to improve their balance sheets. There are limits to what the Bank of England can print. If they printed so much that our overseas trading partners began to feel that the pound was not as valuable as it should be they would treat the pound accordingly. So printing too much doesn’t work but apparently printing £50 billion a year for the banks is fine. The total value of goods and services produced in the UK, the Gross Domestic Product (GDP) is about £2 trillion per annum. The amount owed by the government is currently in the region of £1.6 trillion total or 90% of annual GDP. Other countries have much higher levels of debt (the US at 105%, Japan at 240%, 100% in France and hundred and 35% in Italy). In the UK the GDP generates approximately £720 billion in taxation. Government expenditure, however, is around £50 billion more than that per annum. This £50 billion leads to an increase in the deficit, the difference between income and expenditure. Compared with GDP this is very small indeed. Why should this be a worry? Well it doesn’t need to be at all. At present a significant amount of the government expenditure is treated as essentially wasted in the sense of producing nothing of value to the nation whereas in fact a great deal of it is invested in a variety of assets with a long lifetime and a considerable value to the nation. Money used to build houses which will last hundred years is not in any way wasted. Building hospitals, schools, bridges, roads, railways etc produces assets that improve the value of the country, and its ability to grow and thrive (something it is clearly not doing now). Assuming that all such money spent on infrastructure simply adds to the deficit is fundamentally wrong. The view that the deficit has to be reduced is therefore preposterous. Few other countries have a fully balanced budget. The battle to reduce the deficit is directly responsible for the austerity that has worsened the lot of the great majority of the less well-off members of our society. The Tories say we must continue pushing to reduce the deficit and this is likely to lead the Chancellor to continue with austerity in his November budget. In practice austerity cuts the real standards of living of relatively poor people in the UK while allowing the wealthier to get even richer. Most people are worse off than they were 10 years ago. Unfortunately the Tories flatly refuse to contemplate increasing the tax take on the better off having shelved Labour’s proposal to increase the top tax rate to 50%. That is something that Labour would reinstate as well as rebalancing corporation tax and making a number of changes to make our economic system fairer, particularly with the taxation of multinationals. 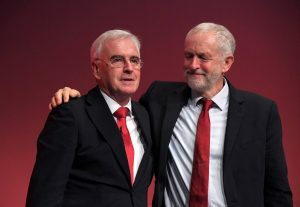 Labour will also borrow money (essentially asking the Bank of England to print money) so that it can invest in a major programme of infrastructure development and in order to regenerate the housing stock in the country. 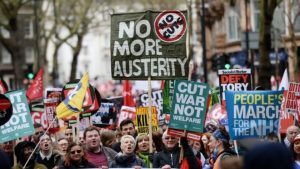 Labour must increasingly emphasise that austerity is a Tory policy which hurts the great majority to the benefit of the wealthy. It allows the real decline in living standards to be blamed on immigrants and benefit scroungers whereas it all should be blamed on Tory austerity in support of the rich. Summary: The problems within the Tory party are growing. The key battle in parliament now is the outcome of the Brexit Bill. A significant number of Tory MPs want important changes to the bill, changes that the Labour Party are keen to see as well. However the risk that hard right Brexiteers in the Tory party begin to project such disloyalty, as they would see it, as supporting Jeremy Corbyn is a potential source of trouble. If that becomes a widely held view then the support of those Remain Tory MPs could easily evaporate. Labour needs to sit quietly and absolutely avoid talking about the war. No, not Catalonia but Catatonia*. This is an infectious epidemic whose symptoms are rampaging through the Tory party and particularly the Tory cabinet. Theresa May’s death spiral continues (see: http://outsidethebubble.net/2017/10/11/the-wheels-are-coming-off/ ) and Labour glee abounds. However, for once, Labour really needs to be very, very quiet indeed about Brexit. In particular, many Tory party members view John McDonnell as a bigger threat than Jeremy Corbyn. It is undoubtedly true that John McDonnell has more fire in his belly and is somewhat to the left of Jeremy Corbyn. That is why both Corbyn and McDonnell must hide themselves away, plotting in secret! Even more important than bringing Labour to power is restoring the authority of Parliament to make decisions about the future of the country. Labour are working with Tory Remainers to ensure that key components of the Tory Brexit Bill are modified to guarantee that Parliament will be the ultimate authority in making a decision on whatever has or has not been negotiated with the EU. 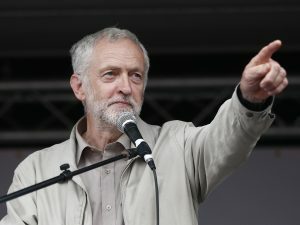 The one thing that has the potential to scupper these moves which are dependent on Tory Remain MPs voting against their own government’s bill is if the hard-core Brexiteers, a noisy, distinctly rabid bunch, start to claim that disloyal (as they would see it) MPs are simply voting with and for Jeremy Corbyn. This will be easy to claim and difficult to disprove. However any suggestion from Labour that there is the slightest whiff of truth in that and all those Tory Remainers will run back to Mummy. The vote will go with the government. Getting these changes in the Brexit Bill are absolutely vital. The Tories are completely capable of ditching Theresa May and appointing a hard right such as Jacob Rees Mogg. Don’t forget that the Tories got within a whisker of appointing Andrea Leadsom, one of the longest surviving brain donors in the Tory party, as Prime Minister. Fortunately Theresa May manage to ease her onto the hard shoulder in time. Unless Parliament has the authority to disagree with the Prime Minister there might be serious problems ahead. Labour should be concentrating on the fractures that are appearing in the always dodgy relationship between the Tory non-majority and the DUP. The DUP are calling for the replacement of Philip Hammond as Chancellor. Whatever you might think of him he is at least one of the slightly more stable members of the Cabinet. He can actually add up. If he was replaced by Michael Gove, one of the names popular amongst Brexiteers for Chancellor, what little confidence remains in the UK government would evaporate completely. Michael Gove is one of these older grey men (even when much younger than his present 50 he seemed terribly old) that seem to run the Tory party these days. To listen to him is wonderful. He is amazingly plausible, very articulate, very neat and tidy while all the time speaking incredible nonsense. While secretary of education he made an incredible mess of revising school curricula. He created creationist schools and introduce secondary level reforms that one expert claimed would “just wreck the English education system”. His pronouncements as Secretary of State for Environment Food and Rural Affairs further demonstrate his remarkable lack of grip of what is actually happening to the country or to farming. To think of the chaos he could cause as Chancellor is simply the stuff of nightmares. So what should Labour do now? It is increasingly clear that the DUP favour a hard Brexit even though the majority of Northern Ireland voters were for Remain. The threat of a hard border between North and South, something that the DUP would prefer is particularly unpopular in Northern Ireland. The practical difficulties in managing such a border would be immense. However it undoubtedly would go right against the spirit and the letter of the Good Friday agreement that brought the Troubles to an end. It might well be illegal as an international agreement. Labour should be using all its influence in Northern Ireland to keep drawing attention to the unpopularity of the DUP because of its role in Brexit. The DUP have been sliding in popularity within Northern Ireland for some time. You can read more about that here: http://outsidethebubble.net/2017/09/05/might-northern-ireland-trigger-another-british-general-election/ . In particular Labour have amassed quite a lot of credit over the years in their more balanced support for left-wing Northern Ireland political parties and in particular Sinn Fein. Labour would certainly not want to undermine the Good Friday agreement, but now is the time to call in some of the debts. As soon the DUP start to distance themselves from the Tory party the current government will start to crumble. But this must not happen before the Brexit Bill is amended. That is why Labour must keep very quiet for a while. Their time will come. These are some of the most worrying times for the UK we have ever faced. The potential damage to everything that this country has achieved over the last century is at risk. Everybody keep quiet please. DO NOT TALK ABOUT THE WAR! *Catatonia: defined on Google as “abnormality of movement and behaviour arising from a disturbed mental state (typically schizophrenia). It may involve repetitive or purposeless overactivity, or catalepsy, resistance to passive movement, and negativism.” Also as a state of immobility and stupor. Summary: The Tory party seem to be in advanced state of chaos. Theresa May can barely hold the Cabinet together. Increasingly senior people in business and government are realising that the worst predictions of the Remain campaign are coming true. Our economy is in a dreadful state now, growing more slowly than all but one G20 country. Normal government in the UK has virtually ceased. Decisions that should be being made are left to flounder and be ignored by the civil servants preoccupied with the Brexit negotiations. The DUP are under extreme pressure within Northern Ireland to sort out the Bombardier problem with 4000 jobs under threat. The Northern Ireland border with the South is still a major problem and the DUP have not been able to find a satisfactory solution with their Tory masters. Everything seems to be going wrong for Theresa May. We won’t dwell on her disastrous speech at the Conservative party conference. Unfortunately the content of the speech was very thin and said little about what she would actually do both domestically and about Brexit. She now has major problems both with the Brexit negotiations which are clearly deadlocked. She cannot risk bringing the Brexit Bill back to the Commons because of the number of Tories supporting seriously critical amendments, virtually guaranteeing defeat if not changed. Grant Schapps may have been seen off but the speculation about Theresa May’s future is, if anything, gathering pace. Increasingly senior politicians in the UK are agreeing with George Osborne who said “If the British government wanted to withdraw its application to leave the EU I think it would be accepted across Europe”. What is also becoming clear is that all the dire predictions of the Remain campaign about economic disaster are becoming true, though much later than predicted. Growth in the UK is the now the second lowest of any country in the G 20. Inflation is rising and productivity remains flat. Companies increasingly are reporting serious problems recruiting. Many are realising that hard Brexit and the consequences for the movement of goods between the UK and Europe will be catastrophic. There are also now reports of European countries preferring to source important supplies from other parts of the EU rather than relying on the uncertainties of dealing with the UK. There has been a noticeable whiff of the decay of her premiership that became stronger yesterday evening. She was interviewed on LBC and avoided a straight answer on the question “would you vote for Brexit if the EU referendum was held now”. She refused to say. Other cabinet members are much clearer. Damien Green’s answer to the same question was that he would again have voted Remain as he did last time. Jeremy Hunt has announced the ending of the public service pay cap. He then went on to make it clear that there wouldn’t actually be any more money for the NHS. Any pay increase would have to be funded from cuts elsewhere. This wonderful announcement has, like most other Tory promises, turned to dust. The inevitable winding down of the Eurofighter production line at BAE has been greeted with a great deal of concern for the future of the 2000 employees who will lose their jobs. Much less concern has been expressed about the 4000 employees whose jobs are at serious risk with Bombardier. They make the wings for an aircraft being assembled in Canada which is now subject to 300% tariffs for sales into the US. The factory that builds the wings is in the heart of DUP territory, yet Theresa May seems to be able to do nothing to help. The close relationship with the US that will help nurture an exciting and promising trade deal following Brexit is not looking very strong. This is worsened by Boris Johnson’s (entirely reasonable) criticism of the US administration’s threats to abandon the Iranian nuclear treaty signed by many countries including China, the UK, Russia and others. The DUP will soon start wondering whether a Labour government might be more productive for the future of Northern Ireland. Certainly the Tories are not cutting it! It is the support of the DUP that is critical to the Tory majority in parliament. This is the time surely for Labour to use their influence on the unions in Belfast to put the squeeze on the DUP. The £1 billion promised has yet to materialise and already there is a concern that it may never do so. In addition, the DUP have come out in favour of a hard border between North and South, something that is very unpopular within Northern Ireland. Even Tory MPs are rebelling against the speed of the Universal Credit introduction and in particular against the six-week wait before money is actually paid to benefit recipients. 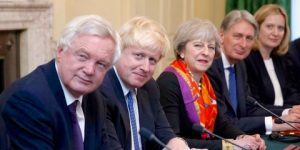 Philip Hammond’s reluctance to fund anything to do with the “no-deal” Brexit has further emphasised the drift of the Cabinet away from hard-core Brexit. The majority now favour a more nuanced, gradual Brexit with a nice long transition period where everything pretty well goes on as before. Including the European Court of Justice. Now there is increasing evidence that the three Brexiteers (Boris Johnson, David Davis and Liam Fox) have been doing a fairly dreadful job in negotiating Brexit. There are even suggestions that they want the negotiations to fail so that a hard Brexit becomes the only option. Increasingly, however, demands for a second referendum if a parliament vote goes against the deal arranged are becoming stronger. Concerns about the EU are widespread but concerns about a post-Brexit UK are becoming even stronger than that. Maintaining that flexibility will also undoubtedly improve Labour’s appeal to its many young activists. These activists must be kept energised and enthusiastic right up to beyond the next election. They must not be taken for granted or be marginalised because of the overconfidence that seems to be rampant within the Labour Party today.